Genuine Australian Opal Jewellery by Laszlo's Opals and Jewelry. Opal Rings and Jewelry by Laszlo's Opals & Jewelry. 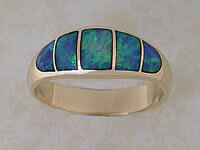 Laszlo's Opals & Jewelry, Australian Opal Inlay Specialists - serving customers via the internet since 2000! Laszlo's Opals and Jewelry are a manufacturer of genuine Australian opal jewelry, specializing in quality opal rings, earrings & inlay jewellery. Our opal rings, earrings, pendants and Australian opal jewelry products are manufactured in-house and sold direct which means excellent value for you. 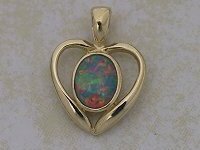 We use only genuine natural opal in our jewelry products. Click the links on the left or the pictures above and see for yourself - our prices ensure opal jewelry is an affordable luxury. We have secure online ordering with PayPal. Our unbeatable prices don't stop at inlaid rings, earrings and pendants! We also manufacture traditional opal jewelry, solids, doublets and rough opal! 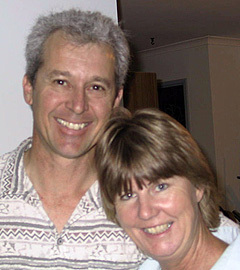 Laszlo & Debbi have spent many years working with opal - mining, polishing and manufacturing. Their knowledge and experience enables them to produce elegant, beautiful designs where the opal perfectly complements the setting. 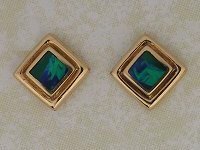 Our opal rings pendants and earrings, which include inlay jewelry are priced well below our retail competitors. Compare our prices and see for yourself. How do we do it? Simple! - all of our products are manufactured in-house and we do not have the added overheads of a retail outlet. By selling direct through our website we can offer real value for money. Our geographical location is ideally situated, in close proximity to many of the world's largest and most famous opal fields - Andamooka, Coober Pedy, Mintabie, and Lambina. Our many years of experience enable us to procure the type of opal that results in beautiful inlaid and traditional opal jewelry. We personally respond to all enquiries regarding opal, rings, earrings, necklaces, jewelery and general queries. We love hearing from anyone who has an interest in opal and are very happy to share our knowledge and expereience. Check out our testimonials, in the following paragraphs which contain comments from some of our many happy customers. We pride ourselves on our attention to customer needs and individual attention to each and every customer or request. When we receive an opal jewelry order, we communicate personally and directly with our customer via email to verify all details in the order. We also contact our customer again as soon as their finished item is despatched. This is a successful formula for developing an ongoing, friendly relationship with our customers and has resulted in a high level of satisfaction and confidence in our products and services. Please enjoy your experience as you browse our website and remember - we are happy to personally answer any queries you may have about opal or jewelry. What makes opal jewelry so beautiful? 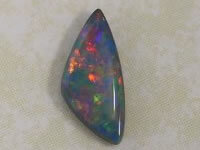 In my humble opinion, it is the infinite variety of color and pattern that makes opal special. Opal has more variety than any other gem and is therefore suited to a wide range of different tastes and preferences. Opal has two levels of color, the base (or background) color and the pattern color (seen as a play of color in a distinctive pattern). Base color ranges from crystal clear through translucent blues or greens, to opaque, pearly white and darker colors through to black. 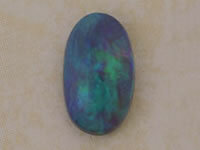 The pattern colours seen overlying the base color of opal can roll, flicker or change as the opal is moved. These colours have great variety, from pastels to bold hues that can cover the entire spectrum of color from red, orange, yellow, green, blue and violet. With so much variety, there is an opal out there for everybody! Laszlo Katona - Proprietor, Laszlo's Opals & Jewelry. We value your privacy and go to great lengths to protect your personal information. Our online ordering is performed on a PayPal. Our security certificate is issued by cPanel. Your order information is used only to perform the financial transaction and ship your goods to your home address. Additionally, we do not store your order details electronically after your item is shipped. This policy has led to successful, trouble free transactions since we began trading over the internet in 2001. Myths and facts about opal and care of the precious gem. Myth: Opal must be periodically immersed in water to prevent it drying out and cracking. Fact:This is probably the most common opal myth. The water content of opal is actually determined during its formation, with water molecules locked in minute voids within opal's crystalline silicon structure. Therefore, opal will not soak up water. 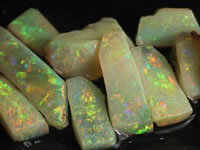 Stable opal has a water content ranging from approximately three to ten percent. Opal may crack or craze if the water content is outside of this stable range. The most likely reason for the propagation of this myth is that immersing a cracked opal in water results in the water infilling the crack, temporarily hiding the flaw and improving the look of the stone for a very short time. Responsible opal merchants source their rough opal from fields that are renowned for producing stable opal and hold their stock of opal for a sufficient amount of time (in a dry environment) to ensure that it does not develop flaws. Myth: Opals should be rubbed with oil or glycerin to preserve color and prevent cracking. Fact: For the same reasons given above, oil will not improve the stability of opal. Oil may cause a scratched or dull opal to appear shinier and therefore brighter. The best way to improve a scratched, dull stone is to have it re-polished by a qualified opal cutter. Myth: Opal is unlucky unless it is your birthstone. Fact: There is some debate over the origin of this myth. Some believe that diamond merchants perpetuated this rumour because they believed the popularity of opal would reduce diamond sales. Another suggestion is that Sir Walter Scott in a 19th century novel Anne of Geierstein (1829) represented the changing fortunes of the heroine as a manifestation of her opal. In the minds of her readers opal became associated with misfortune. Alternatively, there are just as many tales of magical opals that bring the bearers good luck and good health! Ancient Greeks believed that opal gave the owner the ability to predict the future. The Romans believed that like a rainbow, opal brought good luck to the owner and valued the opal as a talisman and protection from disease. People from the Orient regarded opal as sacred. Read comments from some of our many happy customers! and I am more than satisfied. We received the beautiful ring you made for us. We are so happy with the wonderful, flawless job you did for us. Thank you so much. You have made our wedding plans complete and we will recommend you to everyone we know. It was so easy and so painless. I wanted to let you know that we thought the opal ring is really beautiful. It has different colours in different lights, it has brought and continues to bring us both joy. We are happily engaged and wanted to thank for your delivering such a beautiful ring. Darren and Suzanne - Australia. I finally received my ring. I could hardly believe my eyes when I saw it. It is wonderful. You did a fantastic job on it. The colors and sparkles remind me of the ocean. I want to thank you for your beautiful creation. You were correct when you said it will be worth the wait. I feel like I am " On Top of the World" when I wear it. I show it off to everyone. A few people have expressed interest in it and I am going to give them your web site. If I ever get to Australia I'd like to stop by personally thank you. I just received the ring and I'm wearing it as I type this email. It is absolutely gorgeous!!! I love it and basically don't want to take it off. Its the perfect size and is constructed in an extremely comfortable fashion. The opals are even more dazzling than I imagined. Thank you so much for my beautiful ring. Just to let you know how happy I was with the opal inlay ring I ordered for my wife. The quality and beauty of the opal is outstanding! I will be contacting you again in the future for further orders as the occasion arises. Just wanted to say THANKS again for the cross pendant. I received it this past Friday and love it. I have received many compliments and am giving them your name and website in case they would like to order something. I received the opal inlay ring this afternoon. It is absolutely beautiful. In fact, it is so pretty that I am going to order some earrings also. Thanks very much. I received the earrings today, and they are beautiful, as well as being beautifully made. Your quality is very impressive. Thanks again. I received my opal ring and wanted to let you know how much I like it. It's a very fine piece of jewelry and I am pleased with your service. Thank you again. Thank you thank you thank you. You do amazingly beauitful work, it's is way beyond my wildest expectations. Feel proud, you are a true artist. If you have business cards, can you throw a few in with my next shipment. I am getting a lot of compliments on my ring, and I'd like to give people your contact info if they think they might want one. One of the people who asked about it was a stranger at a shopping mall - she said she thought all opal was white - had never seen such a blue color. She went nuts over it. I just received a ring from your business for a college graduation present from my children. I found your web site on line and was very impressed at what I saw! I was even happier to read that you make rings to requested size. It is difficult to find an opal ring in larger sizes to wear on a finger other than the ring finger! I will be sure to share my satisfaction with my fellow "jewelry friends" especially those whom are opal lovers! Beautiful ring, great job, Thank you! I wanted to send you this e-mail and let you know how pleased we are with the Opal Ring and Matching Earrings! Again thank you for the beautiful work!! I have just recieved my ring, it's absolutly STUNNING. Thank you thank you thank you. You do amazingly beauitful work, it's is way beyond my wildest expectations. Feel proud, you are a true artist. Thanks again for another beautiful piece of jewelry. I couldn't have picked a better piece to celebrate a wedding anniversary, the pendant is outstanding! The opal inlay is beautiful and the craftsmanship is second to none. Thank You. Thank you for posting the pendant so promptly, it arrived yesterday. I had bought it as a present for my boyfriend and he loves it. The style is just what I was looking for & the opals are beautiful. Keep up the good work! I received the pendant Saturday and was pleased beyond belief! In fact it's fair to say I was stunned at it's beauty! It is exactly what I wanted and the color matches my earrings almost perfectly. I am very, very thankful to you for such a lovely piece of work in such a sort period of time. I look forward to showing it off! The ring arrived today and the picture on the web page does not do it justice. The ring much more than I expected. Thank you so much. Take care and be well. Thank you, Thank you, Thank you !!!!!!!!!! I am soooo excited to see your beautiful creation! I have been raving about your service and selection and wonderful customer care to everyone I know! I am looking forward to having your wonderful ring on my finger! Thank you. I received the earrings today and they are gorgeous! Wow what a surprise for me on my birthday! The workmanship is excellent and the color of the opals is superb. It has been a sincere pleasure dealing with you. The 'package' arrived safely this morning and I only have a couple of minutes before my wife wonders what is going on. It is absolutely stunning, even better than I expected - my mouth dropped open - no kidding. Many thanks again and best wishes for a happy and prosperous New Year. Thank you so very much for the ring. It arrived just in time and my wife is thrilled. Your quality is excellent. I will be back in touch for future purchases. Please keep me in mind for your mailing list or catalog.... Again, thank you for working so hard for me to get this done by Christmas! Received the beautiful ring 2 days ago and I love it. About 18 years ago I had my first encounter with Australian opals at a shop specializing in them in San Diego. I saw the most beautiful ring there I had ever seen but could not afford it. I have looked around for years and never saw anything like it until I came across your website. I now have that ring I have wanted for 18 years. Thank you both so much. Earrings arrived today, Thanks for the great service, fantastic quality jewellery, will have to order matching pendant in time for Xmas. Just wanted to let you know that I received my ring today, and it is absolutely beautiful. I love it. Thank you so much. I would love to order more in the future. I have my eye on something else already. I received the most beautiful ring today. I cannot express how truly happy I am with the fine workmanship of the inlaid stones and their beauty. I will definitely keep your card with me for not only my future orders, but I am sure that there will be inquiries by those that see my new ring. My fiancé, Penny, wore her Opal Pendant for the first time today and she was absolutely thrilled to bits. She said it was wonderful and very special and that she will wear it all the time. She was most impressed that I went to the trouble to order an opal from half way round the world and I told her that Australia is the best place to go for opals. I looked at a lot of websites before deciding that yours was the best, which it is by a long way. So I would like to say again how great it has been doing business with you and to say thank you for bringing this extra joy and happiness into our lives with your exquisite and beautiful opal jewellery. Just wanted to let you know the ring arrived yesterday... on time as promised. It's a perfect fit and very beautiful. I received the cross today! WOW! It is everything I had hoped for and more. The opals are phenomenal, and your workmanship and artistry is fantastic! I can not thank you enough! I received my opal ring IR15 today. I am amazed, delighted and so happy with the craftsmanship. The inlay colors are just all that I was hoping for in a dream ring. My ring is perfect! The careful packaging is very appreciated and the bonus ring box was a nice surprise too. Your ongoing e-mails really show your remarkable standards for customer service. I appreciate the good care. I just wanted to let you know that I received my beautiful earrings today. I was hesitant about ordering earrings from a website - but you gave so much detail regarding size and colour that I was confident that I would be happy with them. When the earrings arrived they are exactly as described on the website - but so so so much nicer!! The quality is VERY impressive and I can really see value for money. As you can tell - I am absolutely thrilled with my purchase. Thank you so much - I will treasure these earrings forever! Our rings have been received and they are absolutely awesome!! Thank you so much! All I can say is oh my gosh, my ring is gorgeous! Thank you so much from the bottom of my heart. It's a perfect wedding anniversary present. My husband and I began our journey together in Australia, returning to the US and marrying. What a perfect piece of Australia to enjoy forever. You all are amazing. I knew it was a long shot to get my fiance's ring in time for the ceremony, but I asked you to expedite the order if possible anyway. It arrived with 2 days to spare and was absolutely beautiful. We were both very impressed with the quality. He is thrilled with it and we both are so appreciative of the extra effort to have it here in time. It made our wedding day! Thank you again. Use the Google Search tool below to search this website or the web. Compare our prices to other jewellers - we're sure you will find our quality and value is exceptional. This website is now in its twelfth year of providing quality jewelry and gems to our customers worldwide. Click the About Us link to find out more about the people behind the website. You will also find complete contact information. Our email link is on each page of this website and we reply to all enquiries.